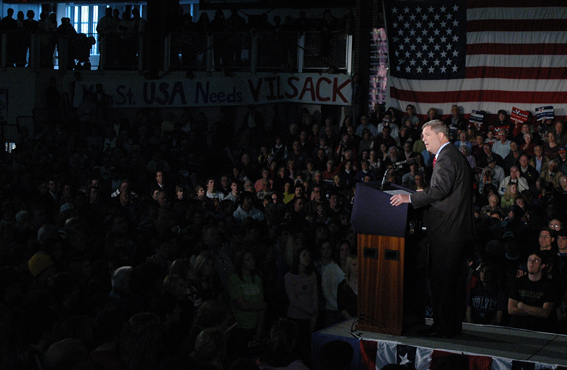 "The Courage To Create Change"
In his speech, which lasted about 18 1/2 minutes, Vilsack focused more on introducing himself to Americans and on speaking to the broad theme of community than on presenting specific proposals or objectives which he would seek to accomplish if he were elected. The 55-year old, two-term outgoing governor highlighted Iowa's role as an alternative fuel producer, stating, "In the past eight years, I've helped lead our state, Iowa, to successfully changing, by making our farm fields into energy fields." Looking to the national level, Vilsack stated that, "Energy security will revitalize rural America. Energy security will allow us to reclaim moral leadership in the discussion of global climate change. And energy security will allow us once and for all to remove and reduce our dependency on foreign oil from foreign countries that do not like us." Vilsack's wife Christie, and sons Jess and Doug, stood a few yards behind him on the stage as he delivered the speech, and the Mount Pleasant Marching Band provided music before and afterwards. Vilsack's announcement put a spotlight on Mount Pleasant, a town of about 8,000 people in Southeastern Iowa (Henry County), where he moved in 1975 with his wife. He worked as an attorney, was elected mayor, and then was elected a state senator, before being elected governor in an upset in 1998. To celebrate the Mount Pleasant community, Vilsack started his White House quest Wednesday evening, the evening before his speech, with a potluck supper attended by about 200 local supporters plus Iowa and national media. "As we travel across this great country talking about the future of this great country, we're going to be taking with us the values, the stories, the inspiration, the support and the love of all of you," Vilsack told the crowd. "And that already makes it a successful campaign as far as I'm concerned," he said to applause. Mount Pleasant is the first stop on a five-state "courage to create change" tour. Vilsack next proceeds to New Hampshire for several events. From there he will fly to Pittsburgh, where he grew up. He returns to Iowa for a major fundraiser, and then goes on to Las Vegas, Nevada and South Carolina. 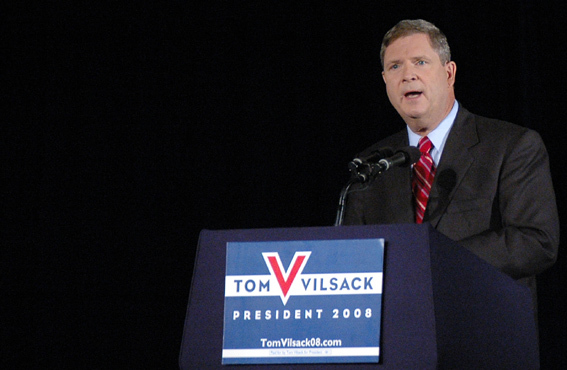 Vilsack is seen as a moderate. He has served as chairman of the centrist Democratic Leadership Council since mid-July. He enters the race as a decided underdog. He is not well known nationally, and even those who admire the work he has done as governor question whether he has enough pizazz to stand out in a Democratic field that could include such stars as Sen. Hillary Rodham Clinton (NY) and Sen. Barack Obama (IL). 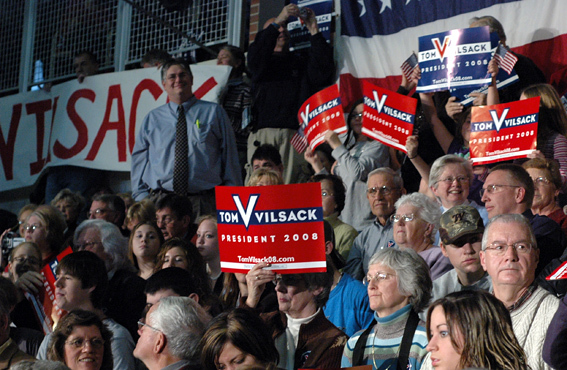 Given his Iowa base, Vilsack might be expected to fare well in the first-in-the-nation Iowa caucuses in January 2008, but polls suggest he might not win those, and other Democratic prospects have not been deterred from visiting the state. 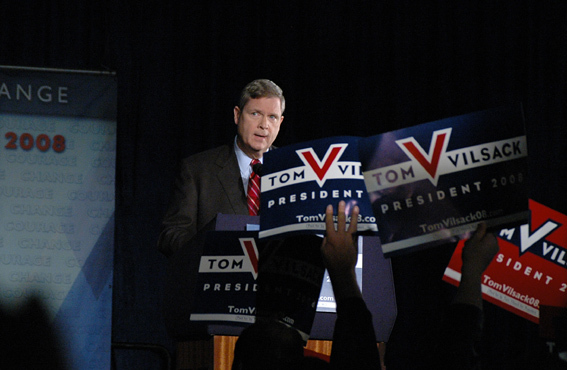 Tom Vilsack for President, Inc.